When it comes to expert commercial and residential plumbing services in the Fox Valley and surrounding areas, there’s no better resource than Mendel (Illinois Plumbing License #058-113671). We’re proud to be the community’s most trusted plumbing company, committed to providing each and every customer with 100 percent satisfaction — which is why most of our customers never work with any other company once they’ve worked with us. Whether you need a service call, an inspection or some other form of plumbing maintenance, we’re here to help! Our technicians undergo rigorous training, credentials checking and multi-level background screenings before entering your home or business. So, when you contact Mendel Plumbing and Heating, you know you’re getting quality, trustworthy plumbing and repair services you can count on — including 24-hour plumbing service in emergencies. Give us a call today at 630-377-3608. 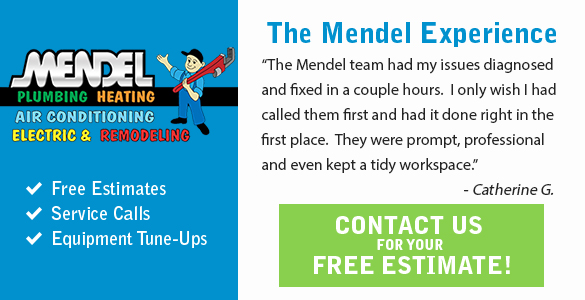 Why Should You Use Mendel, An Expert Certified Plumber? If you have a plumbing need for any reason — whether it’s for a commercial build-out or residential remodeling project — it’s vital that you find an expert plumbing company like Mendel to handle it. A certified plumber gives you confidence of knowing that this professional has gone through extensive training and testing and has the qualifications, knowledge and capabilities to do the job right. You get the peace of mind that comes from knowing that your work will be performed to the highest safety and professional standards. Give us a call today at 630-377-3608 to learn how we can help you with your plumbing needs. “I agree with the statements about the owner, Mike Mendel, taking great pride in this company. I have had the pleasure of dealing with Mr. Mendel, as well as other employees, and they genuinely seem interested in the customer’s satisfaction.